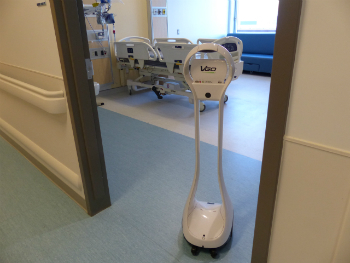 Photos (2): (Above) The VGo robot uses a wi-fi connection to allow users to communicate via teleconference as they move from place to place. The robot's screen panel allows the user to see and talk to people who are logged on at another location. 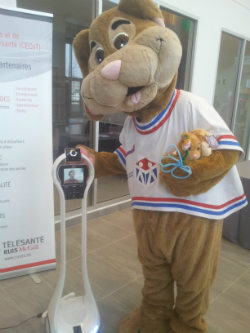 (Right) Caramel demonstrates how easy it is to use the VGo robot at the MUHC Open House in December.